Strudel and Baklava are layered pastries made with a very thin unleavened dough prepared using flour, water, oil or butter, both delicious in their own way, artfully prepared with meticulous care, attention and love. 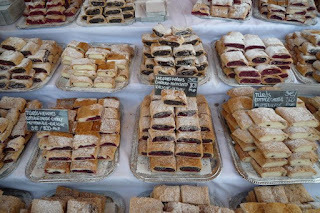 The carefully crafted layers of strudel and baklava with its variety of fillings capture the essence of human ingenuity and the spirit of learning and improvising , for it is not one person that invented these delicious pastries, but many in their own way contributed to pushing the boundaries of its craft and deliciousness. A strudel is a type of sweet or savory layered pastry made of thin layers of dough, with a filling inside, made famous by the Austrians and improvised with different fillings by pastry chefs in the Austro-Hungarian Empire. The foundation of the strudel based on thin layers of dough called phyllo is attributed to the baklava introduced into Austria during the period of the Ottoman Empire, which in the period of 15th and 16th centuries had entered a long period of extending its borders into Europe. 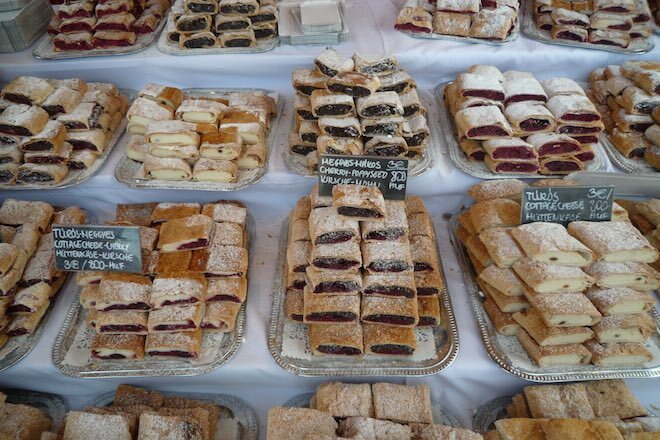 Strudel is a German word which in the form spoken in the High Middle ages (1050 - 1350) literally means 'whirlpool'. The first documented strudel recipe is for a milk-cream strudel (Millirahmstrudel) which originated in Vienna. The original handwritten recipe from 1696 can be found at the Viennese City Library. The preparation of the strudel can vary across different regions in terms of the individual technique used for creating and rolling the elastic dough, and the mixture of fillings used. 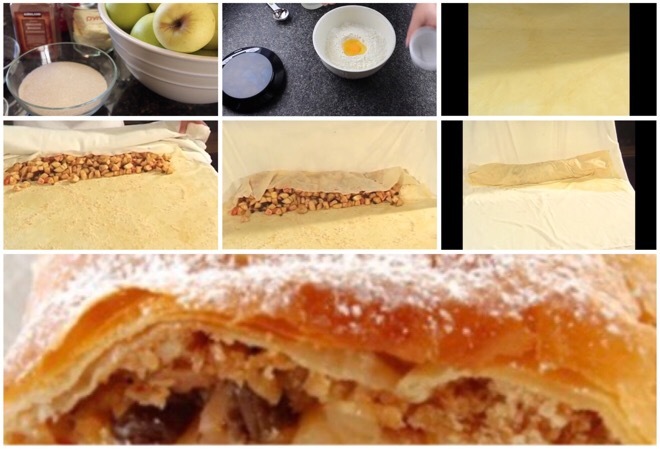 The most fundamental element of the strudel is the crisp paper-thin elastic dough which wraps around the filling and creates a layered wafer thin pastry. For preparing the strudel, the unleavened flour dough, water and oil or butter is kneaded, rolled out and stretched on a table until it is very thin. A light coat of melted butter is usually applied to the stretched dough and often sprinkled with toasted bread crumbs before the fruit filling and other ingredients is laid on it. 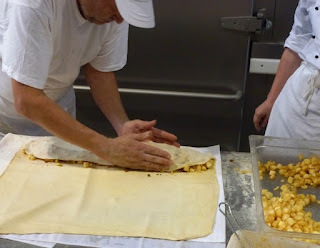 The tablecloth under the dough is then carefully lifted as the dough is rolled over the filling until it's all rolled up. The sides are carefully tucked in or adjusted before the strudel is rolled onto a parchment paper and transferred to a baking dish. A more simpler approach uses ready-made sheets of phyllo dough which are brushed with melted butter, layered, sprinkled with toasted bread crumbs, before the filling is laid on it and then rolled up. Though strudels were being made during the era of the Habsburg Monarchy, their popularity and variety surged during the period of the Austro-Hungarian Empire (1867 to 1918), a union between the Austrian Empire and the Kingdom of Hungary after the lands of the Habsburg Monarchy were reorganized. 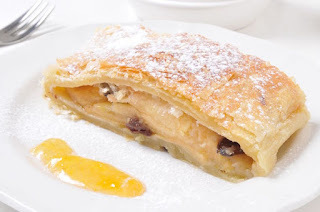 Many different strudels were created during the period of the Austro-Hungarian Empire, some of which include apple strudel, milk-cream strudel, apricot strudel, peach strudel, cherry strudel, almond strudel and savory strudels made from meat and vegetables. The best-known strudels are Apfelstrudel (German for apple strudel) which is considered to be the national dish of Austria and Topfenstrudel (German for quark) made from quark, a fresh cheese that is very popular in Austria. In Hungary they are called rétesek and the traditional apple strudel is called Almás Rétes. Strudel is also popular in Slovakia where it is referred to as štrúdľa, in Slovenia as štrudelj or zavitek, in the Czech Republic as štrúdl, in Bosnia and Herzegovina, Croatia and Serbia as štrudla, in parts of northeast Italy as strudel, and Romania as ștrudel. Though each of these countries/regions were influenced by the Austro-Hungarian Empire, they have their own style and preference for the fillings in preparing the strudel. Baklava is a rich, sweet pastry made of thin layers of unleavened dough filled with chopped nuts such as almonds, walnuts or pistachios, sweetened with syrup or honey. It is a popular and widespread pastry in the Middle East, Central Asia and the Balkans. 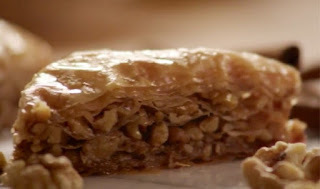 The history of Baklava is as rich as its finely constructed layers of deliciousness and though the Ottoman Empire is credited for introducing the pastry into Europe, it is more likely the culinary confluence of many different traditions and cultures from the Middle East, Central Asia and the Balkans that played a part in creating this deliciously rich pastry. 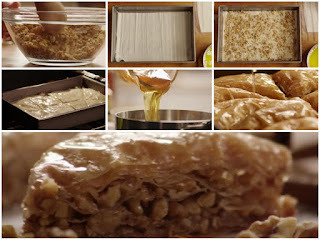 The preparation of the baklava can vary across different regions in terms of how the syrup is prepared or the mixture of fillings used in between the layers of dough. 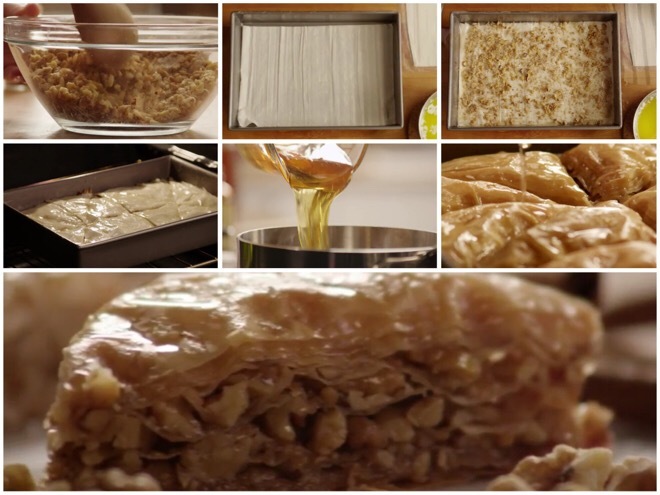 The most fundamental element of the baklava is the crisp paper-thin dough which creates its multiple layers. 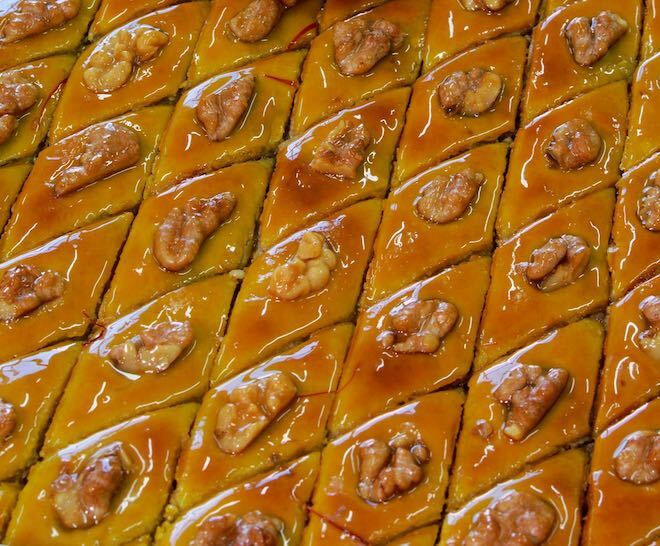 Baklava is prepared in large trays using layers of crisp paper-thin sheets of unleavened flour dough, brushed or lightly sprinkled with melted butter or oil, with a filling of chopped nuts, which typically includes almonds, walnuts or pistachios, sprinkled across the layers. Before baking, the layers are cut into square or diamond pieces using a sharp knife. After baking, a sweet syrup freshly made with honey or a mixture of sugar, water and lemon juice is gently poured across the baked baklava. The predecessor of the baklava was a pastry made of dough filled with nuts or a savory filling. This was a popular dessert or a savory snack in the Middle East and the Balkans. One of the early references to a dessert called 'lauzınaj' made from crushed almonds, wrapped in a dough and covered with a syrup, can be found in the medieval Arab cookbook called Kitâb al-Tabîkh (The Book of Dishes) written by Muhammad bin Hasan al-Baghdadi. The book contains a collection of Persian-inspired recipes and the original manuscript can be found at Süleymaniye Library in Istanbul, Turkey. In Medieval Turkey, the predecessor of the baklava was a pastry called börek made with yufka, a term that refers to a thin sheet of unleavened flour dough. The term yufka is also used to refer to a thin flatbread that is typically folded up around a savory filling. 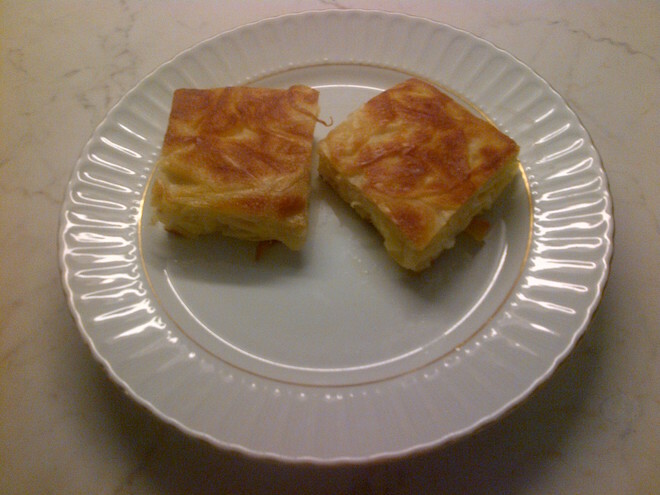 In Medieval Greece, a similar pastry to the börek, called tiropita was popular among the Greeks. This is made with layers of buttered phyllo and filled with a mixture of cheese and egg. A reference to cheese pies, called bökountas tetyromenous and tyritas plakountas can also be found in the Byzantine era. Prior to that, the history of making pastry using dough, cheese and honey goes back to the Roman period, where Cato a Roman historian describes a recipe called Placenta in his 'De Agri Cultura' essay which is considered as the oldest surviving work of Latin prose. The history of baklava is not well documented; and often disputed or claimed by different ethnic groups. The use of thin bread dough and chopped nuts to make desserts was part of the cuisine of the Middle East, the Balkans and Central Asia. It is more likely that the dessert went through constant refinement in these regions and its adoption by the Ottoman palace particularly aided that refinement process. It must also be noted that the palaces and royal houses employed the best cooks from different ethnic groups, who brought with them, their own regional culinary knowledge and refined it. 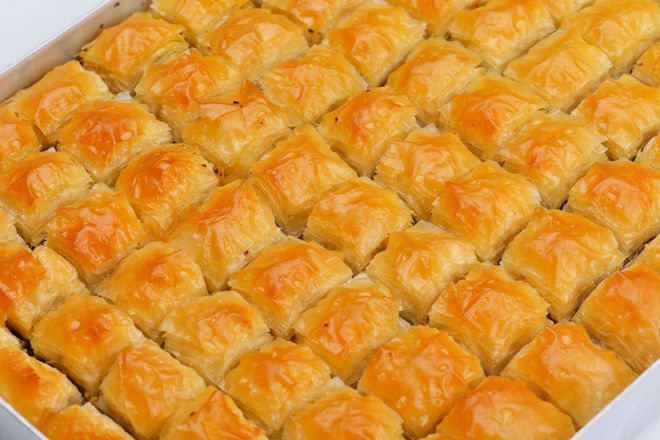 During the Ottoman era, baklava was distributed by the Sultan of the Topkapı Palace to the new soldiers in a ceremonial procession called the Baklava Alayı. It was a popular pastry among the Ottoman sultans who with their expansion of the empire into parts of Europe, introduced the art of making baklava to Europe. 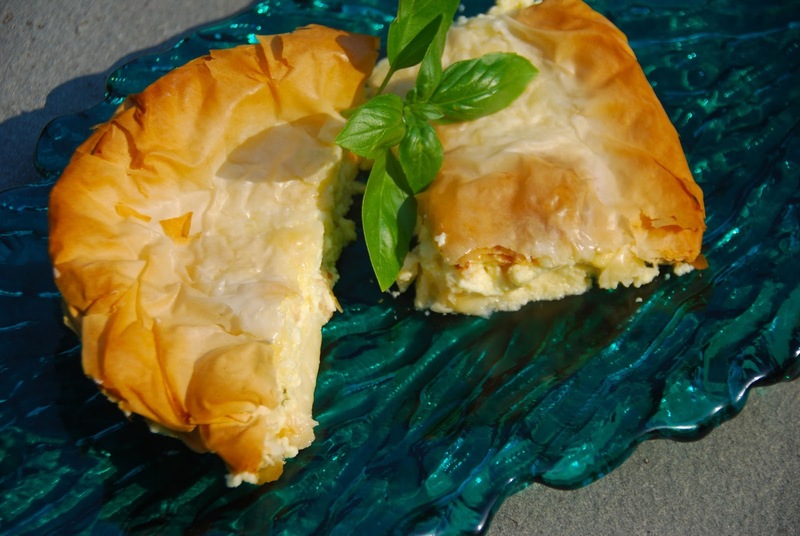 On the Greek island of Crete, an old recipe called 'gastrin' is quite similar to the baklava. It is made of nuts, seeds and pepper layered between sheets of dough using a sweetener made of grapes. Baklava is also considered to be an important part of the Greek cuisine. In fact, the name 'phyllo' comes from the Greek language which means 'leaf', and refers to the thin dough, which was achieved by the creation of the dough technique, that allowed it to be rolled as thin as a leaf. One of the early recipe for a pastry similar to the Baklava can be found in a Chinese cookbook written in 1330 by Yinshan Zhengyao a court therapist and dietitian in the Yuan dynasty. The book documents Han Chinese, Mongol and Turkic dishes. The pastry called güllach, from the Mongol era is created from layers of thin dough cakes filled with nuts and sugar. 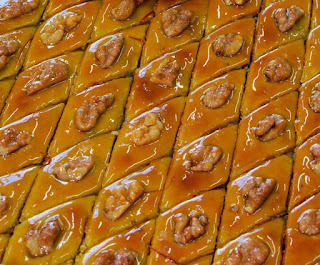 A dessert called güllaç can also be found in the Turkish cuisine, especially consumed during Ramadan, and like the baklava has multiple layers. It is made of thin layers of cornstarch, soaked with sweetened milk which is flavored with rose water, and has mixtures of nuts and sugar between the layers. For me, Baklava is a representation of the human spirit to learn, share and innovate, with each passing generation having contributed to its rich layers of deliciousness. There are many variations of the baklava which include the use of different nuts (almonds, walnuts or pistachios), different flavors of the syrup (honey, or sugar, water and lemon juice), different number of layers of dough, different ingredients used for the filling (cardamon, cinnamon, cloves), the preference of butter or oil for sprinkling on the layers of dough and even the shapes into how the pieces are cut. 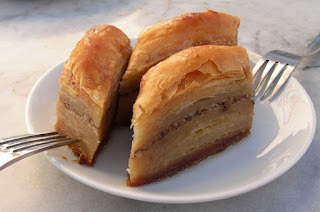 So the next time you have a bite of the strudel or baklava, take a moment to appreciate the human ingenuity in creating both this delicious layered pastries and the years of refinement in their rich historical journeys.